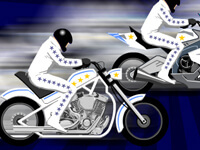 Description: Stickman loves sticky cycling situations.. Stickman Freeride is a Bike Games. Instructions: Arrow keys to balance your way through to mountain biker glory. Space bar - To jump.